In the aftermath of the Great Financial Crisis (GFC), it was widely acknowledged that traditional macroeconomic models of aggregate demand and aggregate supply had failed to provide early warning signals of the financial collapse that was to come. While most economists focus on the business cycle, identified by peaks and troughs in real GDP, they have had remarkably limited success in forecasting when recessions will occur. Following the GFC, some analysts have shifted their attention toward the financial side of the economy and longer-term credit cycles. Ray Dalio of Bridgewater Associates has become famous, not only for building the world's biggest hedge fund, but also for his analysis of How the Economic Engine Works, which is founded on the concepts of the short-term debt cycle (equivalent in Dalio's view to the business cycle) and the long-term debt cycle (equivalent to booms and busts in financial markets which trigger bubbles and busts in asset markets). Geanakopolos theorized that when banks set margins very low, lending more against a given amount of collateral, they have a powerful effect on a specific group of investors.... Using large amounts of borrowed money, or leverage, these buyers push up prices to extreme levels. Because those prices are far above what would make sense for investors using less borrowed money, they violate the idea of efficient markets. But if a jolt of bad news makes lenders uncertain about the immediate future, they raise margins, forcing the leveraged optimists to sell. That triggers a downward spiral as falling prices and rising margins reinforce one another. Banks can stifle the economy as they become wary of lending under any circumstances. In the environment that has prevailed for at least three decades now, just as in the one that prevailed in the pre-WW2 years, it is simply not possible to understand business fluctuations and their policy challenges without understanding the financial cycle. This calls for a rethink of modelling strategies. And it calls for significant adjustments to macroeconomic policies. According to Borio, the financial cycle can be understood as a sequence of "self-reinforcing interactions between perceptions of value and risk which translate into booms followed by busts". The financial cycle has several salient features that often cause it to be ignored by mainstream economists. First, it has a much lower frequency than a typical business cycle. Instead of going from peak to trough every 5-7 years, the financial cycle can take decades. Patterns of economic activity on both the upside and downside simply do not make sense unless the high-frequency business cycle is overlaid on top of the slower-moving financial cycle. Second, the amplitude of the financial cycle is very wide compared to the amplitude of the normal business cycle. This combination means that the financial cycle produces sustained booms and deep downturns. While Dalio's debt cycle, Geanakopolos' leverage cycle, and Borio's financial cycle use different names, all three are highlighting cycles, not in aggregate spending or GDP, but in debt, leverage or credit growth that create self-reinforcing accelerations or decelerations in financial and economic activity. Personally, I prefer the term credit cycle which harkens back to Hyman Minsky's theory of financial instability and the view that the credit cycle is the fundamental process driving the business cycle. While much has been written about the credit cycle in global financial circles, there has been unfortunately little acknowledgement or application of this recent strand of research to Canadian economic forecasting or policy-making. This relative lack of attention is more striking because, since the GFC, Canada has experienced a credit boom of epic proportions. For over a decade, analysts at the BIS and elsewhere have compiled methodologically consistent historical credit data for a wide range of advanced and emerging economies. In recent reports, the BIS have employed its measure of the credit-to-GDP gap (or Credit Gap) to identify countries a that are subject to heightened risk of financial crisis. 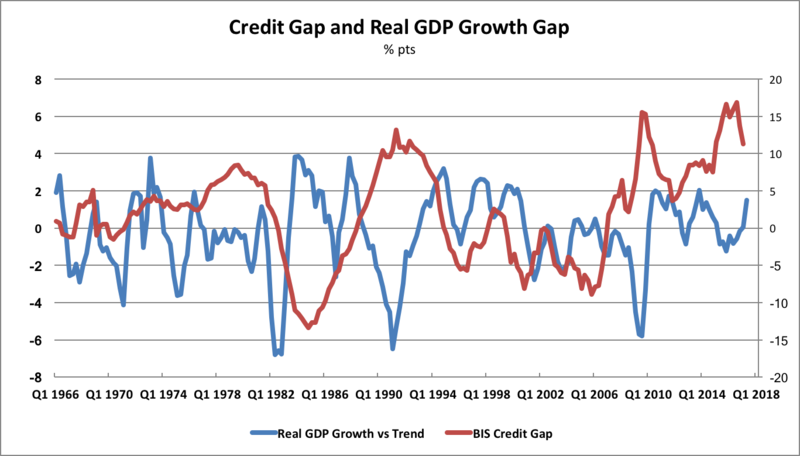 The Credit Gap is defined as the difference between the credit-to-GDP ratio and its long-term trend. The two charts below show the credit-to-GDP ratio and the Credit Gap for Canada with the same measures for the United States shown for comparison. In both countries, the credit-to-GDP ratios have risen steadily over the decades. In both countries, the ratio rose from about 75% of GDP in the late 1950s to about 170% by 2007, at the onset of the GFC. 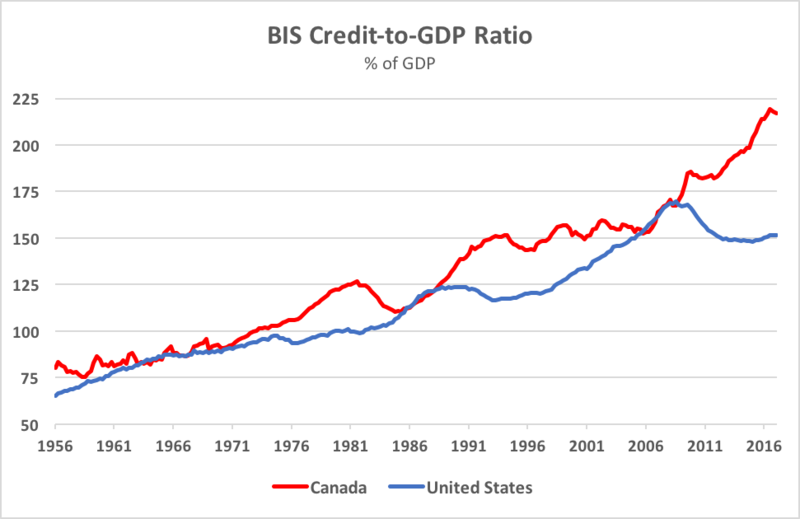 Since then, the ratios have diverged sharply, with Canada continuing to increase leverage to a peak of 219% of GDP in 3Q:16, while the US deleveraged to a ratio just over 150% over the same period. The chart clearly shows that after tracking each other quite closely from the mid-1950s to the mid-1970s, leverage cycles in the two countries have become much less closely linked. The second chart shows the BIS measure of the Credit Gap in the two countries. Since the mid-1970s, while the US has experienced two very pronounced peaks and troughs in its credit gap, Canada has experienced four pronounced peaks and three troughs. The peaks in the US credit gap occurred in 1987 and 2007. The first peak coincided with the 1987 stock market crash and was an early warning signal of the bursting of the real estate bubble and the S&L Crisis of the early-1990s. The second peak coincided with the peak of the US housing boom and was an early warning signal of the Great Financial Crisis that saw the failures of Bear Stearns and Lehman Brothers. 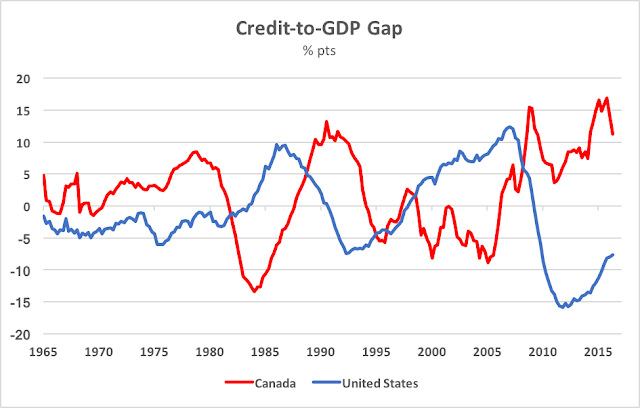 The peaks in Canada's credit gap occurred in 1979, 1991, 2009 and 2016. It is noteworthy that Canada's latest three credit gaps all exceeded the peak levels seen in the US in 1987 and 2007. The peak in 1979 was a precursor to the deep 1981-82 recession. The peak in 1991 followed shortly after a peak in housing prices amid the 1990-91 recession. The peak in 2009, as in 1991, came amid another recession in 2008-09. The apparent peak in 2016, the biggest credit gap ever recorded for Canada, looks to be a precursor to another peak in housing prices which is unfolding as we watch in 2017. Whether the 2016 peak in Canada's credit gap is an early warning signal of another recession remains to be seen. But an inspection of how cycles in credit growth line up with cycles in real GDP growth suggests a serious risk that the Canadian economy is on the cusp of at least a sharp slowdown in real GDP growth. The chart below compares Canada's credit gap with its real GDP growth gap. The real GDP growth gap, analogously to the credit gap, can be defined as defined as the difference between real GDP growth and its long-term trend. While this chart doesn't appear to show a close relationship, my calculation is that the levels of peaks and troughs in the credit gap have a 90% correlation with the level of peaks and troughs in the real GDP growth gap. This may sound complicated, but its not. Using all of the peaks and troughs in the credit gap and the real GDP growth gap, it implies that higher credit gap peak levels have been associated with higher real GDP growth gap peaks and lower credit gap trough levels have been associated with lower real GDP growth gap trough levels. We apparently have seen a peak in Canada's credit gap in 3Q16 at its highest level ever. We have apparently subsequently seen a peak in the real GDP growth gap in 2Q17, as growth in 3Q17 seems to be slowing sharply. Many commentators have been crowing about Canada's recent growth spurt, but the history of cycles in Canada's credit gap suggests that, far from signalling a sustained acceleration of real GDP growth, the peak in the credit cycle is probably signalling the beginning of what could become a serious growth slowdown in real GDP growth ... or worse.